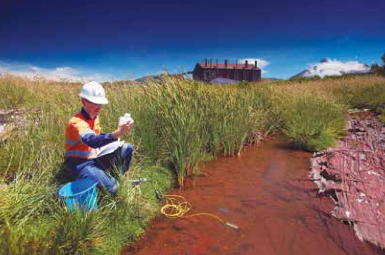 Grange Resources' Savage River magnetite mine is in northwest Tasmania and has been operating continuously from the mid-1960s. CHINESE investment has played a major role in the success of Grange Resources at its magnetite mining and processing operations in northwest Tasmania and will contribute a great deal to the larger Southdown project in Western Australia. 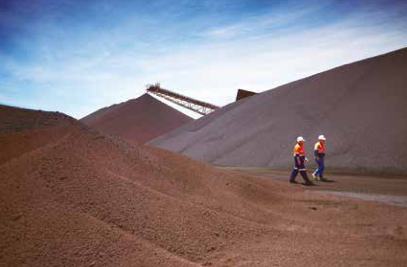 Chinese funding has enabled Grange to maintain and optimize its Savage River operations while China provides a major market for much of the company's premium iron ore pellets. 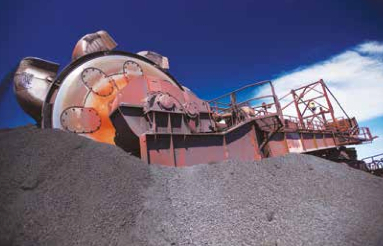 Grange owns and operates Australia's largest integrated iron ore mining and pellet production business. Savage River magnetite mine is 100km southwest of Burnie while Grange's pellet plant and port facility is at Port Latta, 70km northwest of Burnie, with an 84km pipeline linking mine and plant. Shagang International Holdings, based in Jiangsu, holds 46.52% of Grange while Shanghai and Hong Kong based trading company Pacific International owns 8.49% and RGL owns 5.36%. The remainder is owned by Australian institutions with a block of about 10% being European investors, predominantly Dutch, who have been involved since Grange began in 2004. Grange is putting capital back into the business to make sure equipment is capable of running to 2035 and beyond. The operations in Tasmania involve the Savage River mine, a pipeline to Port Latta and port facilities for loading pellets on to vessels. Savage River was established in the mid-1960s and sent its first shipment to Japan in 1967. It has been continuously producing magnetite and transforming it into hematite pellets originally for the Japanese market and then China from the early 1990s. 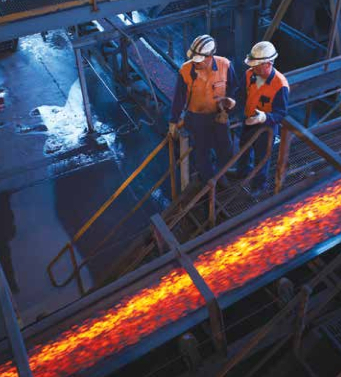 In 2007 private Chinese steel manufacturer Shagang purchased a percentage of the company and in 2009 Grange completed a merger with a consortium involving Shagang, Pacific Minerals and RGL to form a newer, bigger company that held the Tasmanian assets as well as 70% of the Southdown magnetite project near Albany, Western Australia. Grange managing director Wayne Bould says when Savage River was developed based on Canadian magnetite operations it was probably about 40 years ahead of its time. "In transforming magnetite concentrate into an iron ore pellet, it converts exothermically into hematite. It starts as magnetite ore, is crushed and ground into a magnetite concentrate which goes through a blast furnace and comes out as a hematite pellet with about 65-67% iron ore content. The pellets are superior in quality to many other magnetite products due to the lower level of impurities and are of a higher value." He says magnetite is generally produced as a concentrate which is used for coal wash where it helps float off impurities and any iron content in coal, or as a sinter feed where it is sent to pellet plants and made into pellets. "The advantage we have is that the whole process is in the one place at the one time. It is common for other producers to produce concentrate and then ship it to China or India where it is converted in their pellet plants. "Grange was Australia's first major magnetite producer and has more than 45 years' experience. There are some of our people who have been with Grange since the start in the 1960s and our knowledge of magnetite production, particularly the conversion processes, is second to none. We often field requests from other magnetite and pellet producers seeking our knowledge, and regularly host visits from people wanting to start-up magnetite operations. "Nowadays there is more interest in magnetite, especially from China where it is the dominant source of domestic iron ore, although grades are lower. It makes sense for Chinese producers to take high quality Australian magnetite to blend with their lower grade resource to produce reasonably graded product." Wayne Bould says Chinese investment is very important to Grange. 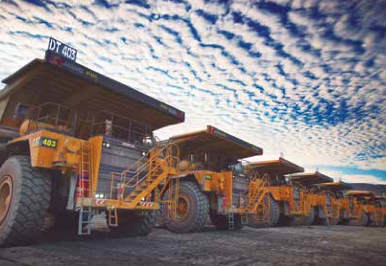 "The 2008-09 merger was predicated on using the Tasmanian assets to help fund development of Southdown, which is five times larger than Savage River and has capacity to annually produce about 10 million tonnes of high-quality concentrate for 30-35 years. 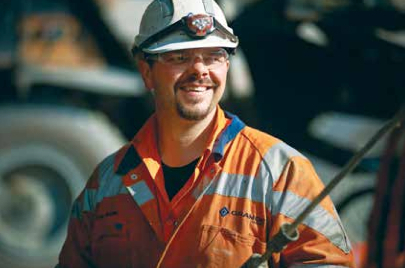 Grange Resources places great emphasis on appreciation of the local workforce in northwest Tasmania. Annual output from Savage River is 2.5 million to 2.9 million tonnes. 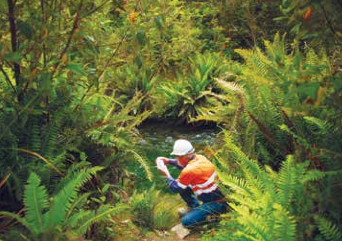 "In 2008 Grange was struggling and seeking an equity partner, so the merger proposal made sense because it provided the opportunity to blend the knowledge and experience gained from Savage River and apply that to development and eventually the mining operation that would become Southdown. Had the global financial crisis not occurred and had there not been some poorly managed projects in Australia in intervening years, I'm sure Southdown would be operating. The Board and major shareholders are still committed to Southdown and we are re-positioning it so we can go to market and get some equity. "We would not be at this point without Chinese involvement but it is also impossible to discount the value of the experience held at Savage River – it is almost non-quantifiable and probably worth more than the asset itself in a market where people aren't that experienced at handling this product. It is a hard operation to run, tight economically and Tasmania isn't the best state in Australia from which to run an export business to China. Despite this we are very competitive." He says instigating and maintaining Chinese investment is not without its difficult moments. "Difficulties occur when there are sovereign rules and laws in Australia which are different to those in China. We have a great deal of support from Chinese shareholders, in fact Shagang is our largest customer and we have a contract with them to take 1 million tonnes of our annual production until 2027, which equates to about 45% of total production. "Difficulties also arise due to the governance requirements, listing rules and guidance which the ASX places on listed company activities - for instance if we decide to dispose of or acquire an asset, however big or small, we need approval from independent directors and sometimes non-related shareholders. There are also some Australian Taxation Office considerations we need to be very conscious of around transfer pricing and related party pricing. If our Chinese shareholders get a little testy with us, it is because the same regulations don't exist in China and they don't understand why we need to operate like this in Australia. The good thing is we have honest, open dialogue as issues arise and we deal with them – it's a learning experience for both of us and we have managed to get through the issues well because of the dialogue." Savage River is a very good asset, he says, but owing to the pipeline to Port Latta, it is constrained to annual output of 2.5-2.9 million tonnes. "The only way to increase output would be to replace the pipeline but this would be cost prohibitive in current times so it is a matter of driving the business as hard as we can. Since the merger we have taken mine life from 2027 to 2030-32 and are about to take it to 2035 by redeveloping some old assets, remodelling the way we mine and mining partially mined remnant deposits. From Shagang's viewpoint this must be a great asset – they bought a reasonably distressed asset with limited mine life and we have added a lot of life and value. "In Australia there is a general view that Chinese investment is likely to be a saviour for a distressed business. Chinese are canny investors and understand what they are investing in before they start, so the notion of a philanthropic Chinese uncle coming along and saving a very distressed business by putting in a lot of money is not likely to occur. Because they understand what they want, they are willing to support your endeavours as long as you work the business properly to the standard they expect, and we have managed to do that. The support we get in keeping Savage River going, even in difficult times, has been first class." As the business is more than 45-years-old but was designed to run for 30-35 years, Wayne Bould says a lot of infrastructure is at the end of its design life. "We are putting capital back into the business to make sure equipment is capable of running to 2035 and beyond. We have been well supported in this process and by 2016 just about all of the core processing driveline will have been replaced or upgraded to provide that capability. Also, as the mine gets older it gets deeper which potentially adds cost in energy requirement for fuelling trucks and for converting magnetite into concentrate and pellet. We have to come up with innovative ways of dealing with this and, again, our major shareholders support us and encourage us to think outside the box, and we have managed to come up with solutions every time." He says, "At Southdown we have finished the definitive feasibility study to the point where we could seek finance based on its level of completion in December 2012. Although the global project market has been slow there are signs it is changing, slowly but surely. Prior to 2012 there was opportunity to get funding support from China but policy changes have made this more difficult. What Grange decided with Southdown was to keep it on hold – to maintain environmental, mining and government approvals secured to date, keep our land tenure in place, and do everything needed to keep it at its current state, but there won't be any development until we can find a way to fund it or find an equity partner who would be willing to buy up to 50% of our share. "Ultimately, we may need to change the model slightly to fit changes in global requirements for magnetite products. We have had the project sitting there for more than 12 months with a small team maintaining it and the Board will review it again in December. There appears to be a desire to start to push it out there again, go harder at seeking an equity partner, open more discussions with Chinese financial institutions to get more funding and remodel it in a bid to reduce the capital cost. "One of the problems is that it's at Albany, is the only mining project in the region and there is no infrastructure to support mining – no power, insufficient water and the port has not been built to take the size and number of vessels you see going in and out of the Pilbara region. To develop this infrastructure, Grange is required to provide funding up front on behalf of the State Government and over time the government resumes ownership. This adds about $800 million to the capital cost so among the discussions we are having with the government is how to find another way to manage the infrastructure requirement. It is an excellent project and with our expertise we could make it work very well, so it is important we find an equity partner." In 2012 Grange had a wall slip at Savage River and had to effectively move two years' of waste in one year. Wayne Bould says this added a lot of cost but helped reshape the mine for the longer term. "We have about $135 million cash in the bank and are debt free. By the end of 2013 we will have recovered our situation to the extent that we have $145-150 million in the bank and 2014 is looking good. Most pundits are talking steel and iron ore markets up, and most forward projections are looking better than when we did our modelling in early 2013. Magnetite is processed into concentrate and this is then transformed into hematite pellets for export to Asia. "We recently had institutional investors have a look at Savage River and their view is that the company is performing well but very undervalued. They were impressed with what they saw and said that we have to get on and do something. Another opportunity if Southdown isn't put together in the timeframe we want, is a merger or acquisition of another operation rather than leaving the money in the bank. "In 2011 the Board adopted a policy of returning annual dividends while the company remains cashflow positive and based on our share price we are providing about a 10% yield, which makes us pretty attractive on that basis. We have the attitude that if we want to survive as an operation, we need to be better and smarter than others. We didn't coast in the easy periods, we ran the business hard and drove our cost profile hard so that when we knew the bad times were coming, it was business as usual." "Mining is a difficult business and conditions in Tasmania are rugged, apart from the fact we don't get snow all the time," Wayne Bould says. "It is inherently dangerous and we can't do the job without our people. We have an absolute obligation to protect them and send them home daily in at least the same condition as they arrived. It took three years of hard work and strong leadership to change the safety culture we saw in the business when we did the merger. There's an element of pride in this but we also maintain 'isn't this what you should do anyway'." Savage River had a lost time injury free rate of 1195 days as at November 20. Community support is important. "We operate in a region with just about the highest unemployment in Australia. A regional population profile would show close to 70% of those who are workplace fit have not obtained any higher than year 12 education. They are great people, they work hard, they're innovative and very smart without having a piece of paper to prove it, but they rely on having a job in a hands-on area where they can add some value. It's important for us to give them loyal support to repay the loyalty shown to us. There is a major flow-on effect of about four, five, or maybe as high as six to one when we spend a dollar locally – a lot of services are supplied by local contractors, many of which are mum and dad businesses. "We have a policy of buying locally when it's equitable to what we would pay elsewhere, and it mostly is. This gives us a lot of support in the community and is reflected by the way the community has got behind mining development in the face of some of the environmentalist activity seen in the past few years. The local population understands it can't be the silent majority if it wants work and jobs in companies like Grange; it needs to stand up and demand those jobs and demand that Grange gets the approvals it needs to develop the business. They've become vocal in the face of statements made by the Greens and the like, which is encouraging. Grange has a policy of being honest and open with all of its activities. "The respect garnered from State and Federal governments by moving our head office from Perth to regional Tasmania was a demonstration of confidence in the region and an indication that business can be done regionally. The local workforce is dedicated and talented – it's a lifestyle choice for them to live here, they want to grow with their families, they want their kids to see their grandparents and they want to be grandparents locally. The loyalty we get in this regard is huge and our turnover is extremely low at less than 1%. We have a long-term, loyal workforce – you just can't buy that. "Grange has always been honest and open. Where we see statements made at a high level with unvalidated data we respond with empirical data. When we intend to do anything with potential to require environmental approval, we invite people like the Tarkine National Coalition to sit with us, have a look at what we intend doing, explain why and what the value is. Additionally we have empowered all our people to speak on the company's behalf with regard to any activity and the value of it. Having an open book, having nothing to hide, having our workforce engaged and aware of what we are doing and why has made a huge difference to acceptance of what we do in this region," Wayne Bould adds.